Welcome to December! 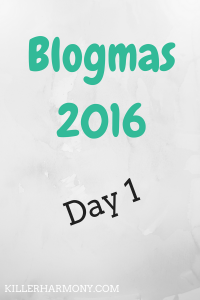 Since it is December 1st, I am going to share with you my first post of Blogmas 2016! Blogmas, or also called Vlogmas, is when bloggers and YouTubers commit to posting something on their website or channel each day in December. We do it to celebrate the holiday season and to share our love of blogging/vlogging with all of you! I’m super excited to share a new post every day! Want to know more? Keep on reading! Blogmas is when a blogger posts something on their blog each day in the month of December. Some people blog every day the entire month, some might blog every other day, some might blog only until Christmas Day. However you do it, it is a great way to improve your blogging skills and practice your writing. Yep! I’m going to be bringing a new post to you each day this month. Now, a little disclaimer. Since I will be posting something each day, my posts will probably be a bit shorter than my normal weekly posts. I will still try to have one long and detailed post each Monday, but on the other days, the content will be shorter. I value quality much more than quantity, so I would rather write a good post that is shorter than a longer post that I’m not proud of. What Posts Can I expect? You can expect some posts that are a bit out of the norm on this blog. I will be posting some stuff with tips and advice for finals and the holiday season, some personal posts of things happening in my daily life and more. As with anything I post, I hope that this year’s Blogmas will inspire and/or inform you and lead you to a better life. What Time of Day Will You Post? It will probably vary depending on the day. I don’t plan to have any posts go out super early in the morning like normal, but I don’t want to post super late at night either. The posts on Mondays will be up around their normal time, and the rest should be up during the middle of the day, hopefully. I’m a college student first, so stuff might get in the way; I don’t want to make any promises that I can’t keep. Be sure to follow me on Twitter (@HannahHaefele) since all of my blog posts are auto-shared upon publishing! You can also just visit this blog regularly (hannahbflute.com) and check if something new has been posted! I also hope to be able to share some posts from other bloggers and vloggers doing Blogmas/Vlogmas, so follow me for that stuff, too! If you are a blogger/vlogger or want to start, now is the perfect time! Posting every day is not easy, but it will surely give you the chance to see if it is something you really want to do. If you have been blogging for awhile, this is also a great way to get inspired if you haven’t been lately. This post is going up on the first day of December, so you can still join! If you are looking for ideas, Kayla from Kayla Blogs made an awesome list full of ideas for everyone. Are you doing Blogmas/Vlogmas? What sorts of ideas do you have for posts? Comment below! Thanks! This is my first time doing it, too. I’m so excited! I will definitely check out your posts! It’s my first year doing this too and I’d read that the posts need to be Christmas related….starting to struggle so I think that next year I’ll probs try and keep its bit more broad like it sounds you’re going to do! Yeah, I thought about Christmas related posts, but a lot of people who post videos do daily life vlogs.